This Industry Watch report examines one of the most under-recognized areas of the media and advertising worlds: call commerce. Formerly referred to as “call monetization,” it involves driving, tracking and optimizing inbound phone calls as a form of business leads. 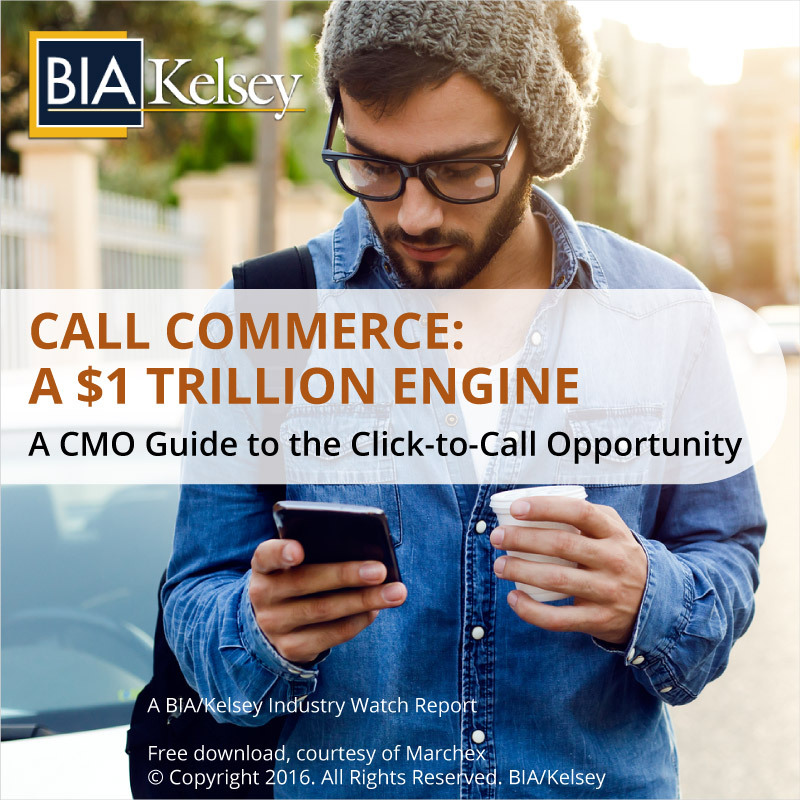 At BIA/Kelsey, we estimate click-to-call influences more than $1 trillion in U.S. consumer spending. Intended as a CMO guide to the click-to-call opportunity, the report covers where call commerce is today, where it’s going tomorrow, and what you need to start doing and thinking yesterday. BIA/Kelsey projects 169 billion mobile calls to businesses by 2020, driven by smartphone penetration, high commercial intent, and the natural handoff between mobile engagement and phone calls (i.e., Google “call” buttons). The mobile formats that launch voice calls to businesses are broadening. This affects and informs anyone driving and tracking high-intent phone leads to businesses, especially in high-value call-centric verticals like autos and financial services. This report explains calls are boosted by an on-demand culture. The rise of the smartphone has conditioned users to expect everything at the push of a button. Closely related to immediacy is location. As seen in many other media (especially mobile-oriented channels), location can greatly increase contextual relevance, and thus performance and engagement. Calls are no exception. What mobile formats drive the most calls? How are marketers taking advantage of call commerce? What are best practices in driving and tracking this activity? BIA/Kelsey’s Industry Watch series examines key trends and opportunities in tech and media sectors. Applying BIA/Kelsey’s analytical and editorial eye, it selects topics based on the criteria of industry growth, disruption, opportunity or notable lessons. These reports join BIA/Kelsey’s editorial calendar, with the additional opportunity for companies to underwrite distribution. This includes industry players that wish to bring reports out from the paywall, thereby amplifying the marketplace’s access to, and awareness of, a given topic. Underwriters get brand benefit in being associated with the free and open distribution of an industry report. Disclosure: Marchex has underwritten the distribution of this report. BIA/Kelsey maintains editorial independence throughout all stages of production. Report contents are not co-produced or influenced by underwriters, though they can provide source material and data on which analysts build narrative, at their full discretion.